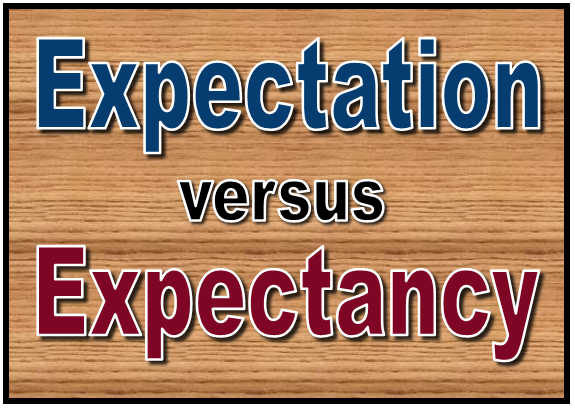 Every believer will need to sort out the difference between expectation and expectancy during their lifetime. The way that leads to life in this world is often narrow and requires balance to avoid the ditch on either side. This is similar to the distinction we need to make when we discern the difference between Self-Sacrifice and Sacrifice of Self. In a nutshell, when we have a certain “expectation” it may come from a sermon or teaching that arouses our faith or we have a great need to believe God for something specific. This is when our circumstances require us to believe that God is going to do something. However the potential for a setback and an offended heart lies at the door of this scenario. It’s because we often imagine how God will do this miracle and we inadvertently put our faith in the “thing” we imagined more than in God Himself and His will in the situation. This is called putting our faith in our faith. It also reminds us why God didn’t want us to make any graven “images” of Him in the Ten Commandments. Images carved in stone or carved into our minds almost always keeps us away from Him Who is the eternal, uncontainable Spirit. There is a big difference between serving the God we want and serving the God Who is. This wrong focus often happens when we use the Bible selfishly as a “utilitarian tool” instead of a love letter that leads us to the heart of God. We see countless disillusioned believers who put their faith in what they believe God is going to do versus putting their faith in Who the miracle worker is. There is a difference between believing in healing and believing in the Healer; believing in salvation and believing in the Savior. Disillusionment is a good thing in some cases because we need to be removed from some of our illusions. We initially don’t recognize there is a difference between expectation and expectancy until we don’t get what we are praying and believing for after an extended period of time. This brings us to a fork in the road where we must choose between our belief in the thing we want to happen and our belief in the Lord Himself. How do I know the difference? One sure way to recognize if your faith is in the wrong thing is to inventory your thoughts when the thing you are believing for doesn’t come to pass. Are you insulted or offended? Are you bitter or resentful? Have you secretly disengaged from the fight? Are you just going through the motions? Do you have a secret accusation against God? An Idol of Expectation. I remember several occasions being so angry with God about my circumstances not changing. I thought I was faithful; I was living right and I was standing in faith yet with no results. I didn’t recognize I was secretly offended and was developing a cold heart. I also didn’t realize the source of my offense was because I placed my faith in the scenarios I constructed in my mind in the first place. I even thought I was being so generous to God. After all, I even gave God 3 or 4 different scenarios that He could use to answer my prayer. Wasn’t that so benevolent of me? I was so proud of how humble I was. Yet God is His wisdom and mercy had to let me experience the death of my expectations so I would be free from putting my faith in my “image” of answered prayer; in my ability to intellectually devise a scenario for God to work. An Attitude of Expectancy. I am learning to keep and attitude of expectancy in my life. When I do, I am more peaceful and relaxed as I am more willing to go with the pace of grace. My faith is in the goodness of God, as I remember He always has my best interest at heart (see Jeremiah 29:11). I now know God is always good and has an agenda of abundant life planned for me. I am beginning to appreciate the “journey as the destination” with God. He could make everything we need appear instantly but He has predestined us to be “conformed” to the image of Jesus. Sometimes delay isn’t denial, it’s just God’s wisdom at work. Besides, regardless of whatever I am believing for, it is always a lessor thing compared to the glorious relationship we have with Him as we are travel on this journey. This realization becomes real after our imposed deadline for what we are expecting passes or our faith expires. Then we often see God turning circumstances around in way that had nothing to do with the scenarios we imagined in the first place. In our early years it seems almost impossible not to construct some idea of what it will look like to believe God in a particular area of our lives. We all try to imagine how a particular answer to prayer might turn out. It’s not easy telling a young person that the latest thing or boyfriend they want so badly isn’t really going to make them happy in the end, because it’s what they “imagine” will make them happy. We only come to appreciate this when we don’t get what we want and God gives us what is best for us. He reminded Israel of this in the book of Isaiah. It is a painful lesson to be circumcised or pruned from our way of thinking but the result is a more intimate relationship with the Lord. So if you are not receiving from God what you are expecting remember what Garth Brooks said in one of his songs… “Some of God’s greatest gifts are unanswered prayers”. We can keep an attitude of expectancy with God because He is faithful to His word and He loves us enough to sacrifice His own Son for us. Posted in Most Popular Articles and tagged Difference, Disappointment, Discernment, Expectancy, Expectation, Garth Brooks, Jeffrey B Krall on July 29, 2014 by Jeff Krall.